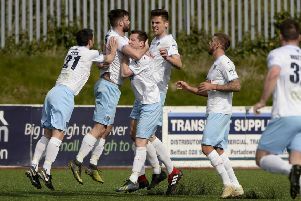 Wakehurst boss Paul Muir says his side will now re-focus their efforts on getting away from the foot of the NIFL CHampionship Two table after their hopes of Craig Memorial North West Cup glory came to an end at the weekend. Muir’s men lost 4-0 in the semi-final to Champinship One Institute, who set up a Boxing Day final with neighbours Limavady United. The cup run had provided a welcome distraction for Wakehurst but they found the Drumahoe side - who last season were playing in the Danske Bank Premiership, too tough a nut to crack. A miserable day for Wakehurst was compounded when top scorer Tiarnan Rafferty saw his penalty saved. “It was always going to be a big ask against higher league opposition,” admitted Muir. “But there were positives from the match including the return of George Young to first team action after knee surgery and Nigel Turner after a month out through injury. “We also had Gavin Gilmore and Conor Ross back in starting line up after both had got some game time with the Reserves so it will add to the competition for places. “Unfortunately Jordan Lemon and Andy Millar remain out though injury. “The cup exit allows us to concentrate on the league as we endeavour to get out of the danger zone,” added Muir. Wakehurst travel to Seaview this Saturday to take on Newington YC in a crucial Championship Two fixture, with the Ballymena men looking to climb off the bottom place in the league table.